The cost is low and the quality is high. It's fast, easy, and uncomplicated to install, yet amazingly durable, long-lasting, and simple to maintain. We're talking about precast concrete -- an extremely practical (as well as surprisingly good-looking) material that can be used to construct walls, gates, and fences for all kinds of applications at your home, business, or farm. Would you like to know more? Here are 6 questions and answers on precast concrete and its uses. How is precast concrete for walls, gates, and fences made? Precast concrete is shaped in metal or polypropylene molds in a factory, rather than cast on the building site. Depending on the intended use, it is frequently reinforced with steel. Components are manufactured and cured under controlled conditions, rather than the variables faced when concrete is poured in place outdoors. Walls and fence panels are formed to exact dimensions and can be made in any height up to 20'. How does installation compare with conventional materials? It's faster and less costly to install precast concrete walls, gates, and fences than conventional materials, such as wood, bricks, blocks, or poured-in-place concrete. Your concrete contractor will not have to bring in as much equipment, meaning there will be minimal disturbance to your property, and less mess to deal with afterwards. Precast walls or fence panels are flexible to use and easily "custom-fitted" to your site, no matter how uneven the surface may be. And if your requirements change in the future, the wall or fence can be readily dismantled and reassembled wherever you choose. Virtually no maintenance is necessary. 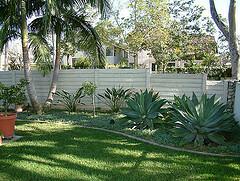 Once you've completed the precast concrete fence or wall install, that's it. You will not have to pay for painting, oiling, resealing, rust removal, etc. (although you certainly can paint if you'd like a change of color). All you'll need to do is wash the concrete occasionally, which is simple to do with your garden hose. Repair is equally uncomplicated, since individual components can be replaced if damaged -- there is no need for time-consuming and expensive repairs to the entire structure. Does precast concrete stand up well to climate and other outdoor conditions? The in-factory casting and curing means the concrete's quality is precisely standardized. It also ensures that your structure will be solid and durable, even in the harshest climate. Precast concrete, gates, fences, and walls have a long list of attributes: They are wind- and earthquake-resistant, fireproof, insect-proof, and rustproof; and they will not rot, mold, fade, or warp with time. Doesn't concrete tend to be unattractive? That depends. You could certainly install precast concrete that is utilitarian -- plain, simple, and very low-cost -- if it suits your purpose. On the other hand, you might prefer to choose something more decorative, which will give your property a distinctive appearance. For example, precast concrete is available in finishes that give the appearance of traditional fencing materials such as bricks, wood, or natural stone for a warm, natural feeling. Interesting colors and aggregates can also add visual appeal. What can precast concrete fences, gates and walls be used for? Marking the boundaries of your property in a neat attractive way. Screening your home and garden to maintain your privacy. Keeping small children or pets from wandering out of your yard. Containing cattle, horses, and other farm animals. Insulation against noise -- especially useful if you are located near a busy street. Serving as a retaining wall on a steeply graded plot of land. Construction of a security fence to prevent intruders from accessing your home.